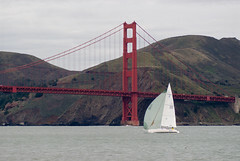 The Golden Gate Yacht Club organized an interesting race today. It only had three marks and they could be rounded in and order and from any direction. Each mark was just off one of the Bay Area’s major bridges (Golden Gate Bridge, Bay Bridge, & Richmond-San Rafael Bridge). Only solo or doublehanded crews were allowed to participate. I got a few shots of some of the racers. 27 Jan This entry was written by Shawn, posted on January 27, 2008 at 4:48 am, filed under event, sailing and tagged sailing. Bookmark the permalink. Follow any comments here with the RSS feed for this post. Post a comment or leave a trackback: Trackback URL. Older: Golden Gate Bridge jumper?